The 2018 Hyundai Santa Fe Sport is designed to look good in all surroundings. The sleek and elegant style is accentuated by details like standard chrome door handles and standard privacy glass. LED running lights are available for enhanced visibility and standout style. The interior of the new Santa Fe Sport is made to make your life easier. YES Essentials® stain-resistant cloth is standard for a level of durability uncommon in family SUVs. It also features standard 40/20/40 split folding rear seats, which makes loading your Santa Fe Sport that much easier. 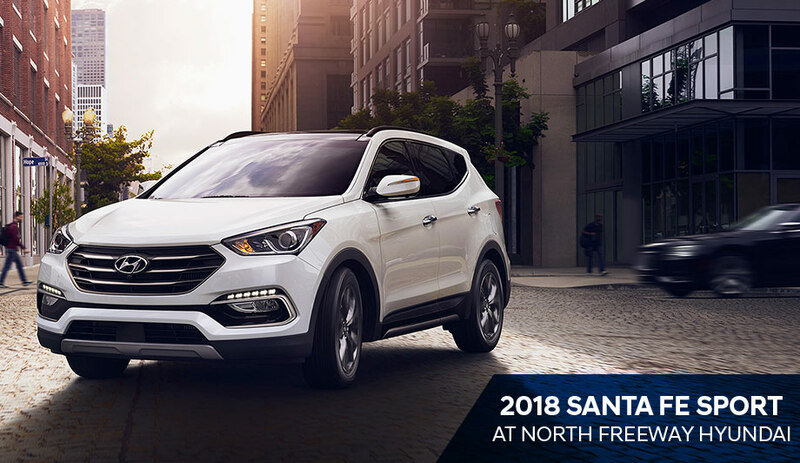 See the new Hyundai Santa Fe Sport by taking a test drive at North Freeway Hyundai today. The 2018 Hyundai Santa Fe Sport is equipped with a wide variety of standard safety technologies to help prevent as many collisions as possible. This tech includes Vehicle Stability Management, Electronic Stability Control, Traction Control System, Downhill Brake Control, Hill Start Assist Control and a rearview camera. None of the Santa Fe Sport's competitors have this sort of package of safety technology. Test-drive the new Santa Fe Sport at North Freeway Hyundai to feel the difference advanced safety technology makes. The 2018 Hyundai Santa Fe Sport is easy-to-drive in all situations, but that doesn't mean it's boring. The standard engine is a peppy 185-horsepower 4-cylinder with a meaty 178 lb.-ft. of torque. A turbocharged 2.4L kicking out 240 horsepower and 260 lb.-ft. is optional for sportier drivers. Another popular performance option is all-wheel drive, which increases grip on slick roads for better handling and enhanced stability. Put the Santa Fe Sport through its paces by taking a test drive at North Freeway Hyundai today. The 2018 Hyundai Santa Fe Sport is equipped with a wide variety of ergonomic and useful tech that'll enhance your everyday driving experience. Bluetooth® connectivity is standard, so you can play music from your phone and take calls without taking your eyes off the road. A 6-speaker audio system with MP3 capability is also standard, so you can enjoy your music on every drive. A premium 12-speaker Infinity® audio system is optional for passionate music lovers. If you live in Houston, Spring or The Woodlands, TX take your chance to check out the tech in the new Santa Fe Sport with a test drive at North Freeway Hyundai dealership today.